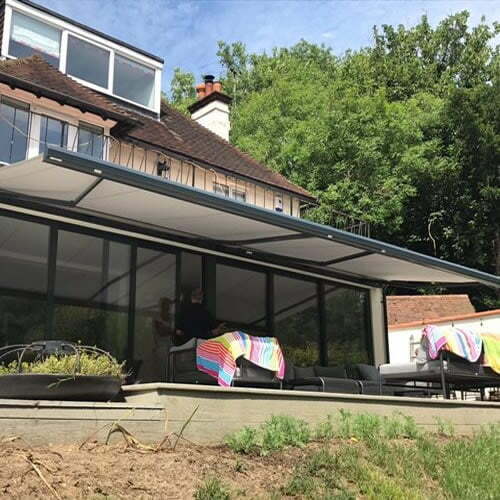 With Open Patio Awnings, Semi Cassettes, Full Cassette Awnings and even Traditional Victorian Awnings, which one is for you? Generally speaking we fit the Open Awnings and the Semi Cassette Awnings to shops and businesses. These are the ones which are in constant use every day. Alternatively if you need a good quality budget awning then a Semi Cassette Awning may well be all you need. Most customers choose the Full Cassette Patio Awning for their homes. This means that when you retract the awning, the arms and fabric are enclosed inside the cassette. This keeps them nice and clean for when you next need it. 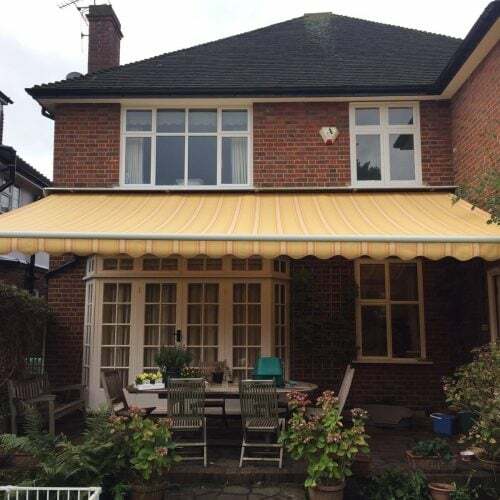 We can also install Traditional Victorian Awnings to homes. However they really only offer shade inside the home rather than you being able to sit underneath them. 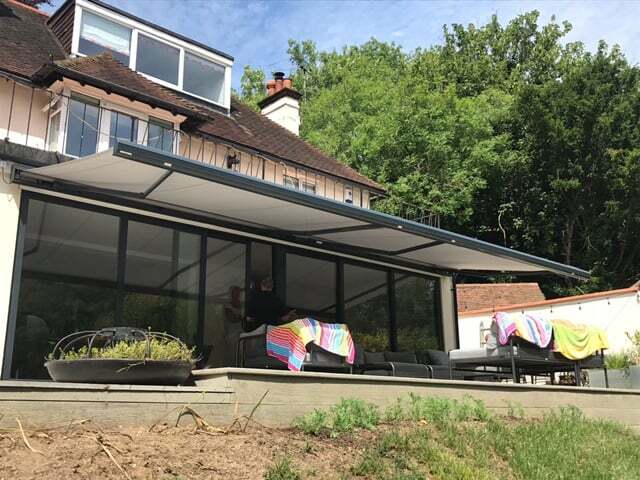 Patio Awnings fitted to your home not only add shade inside but also offer you a place to sit under and entertain in the long summer evenings. Patio Awnings have a long history (they even get a mention in Wikipedia) and are getting more popular every year due to their ease of use. Customers like the fact that there is no real maintenance to speak of. Additionally, they like the nice sleek finishes which add to any home and garden. 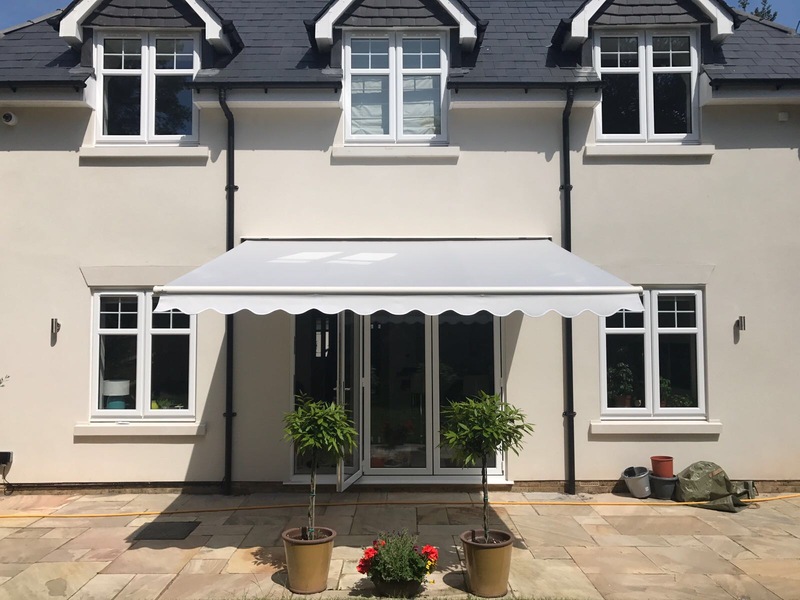 With such a vast selection of Patio Awnings available it is difficult to know which Awning will be the most suitable for your home. 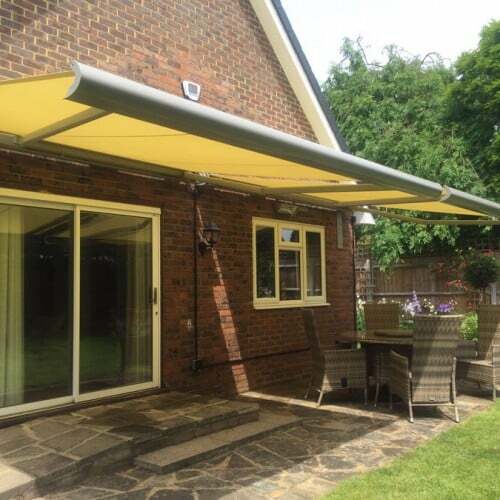 Most Patio Awnings are up to 5000mm in width but we can go larger if you need. The largest single awning is 7000mm. 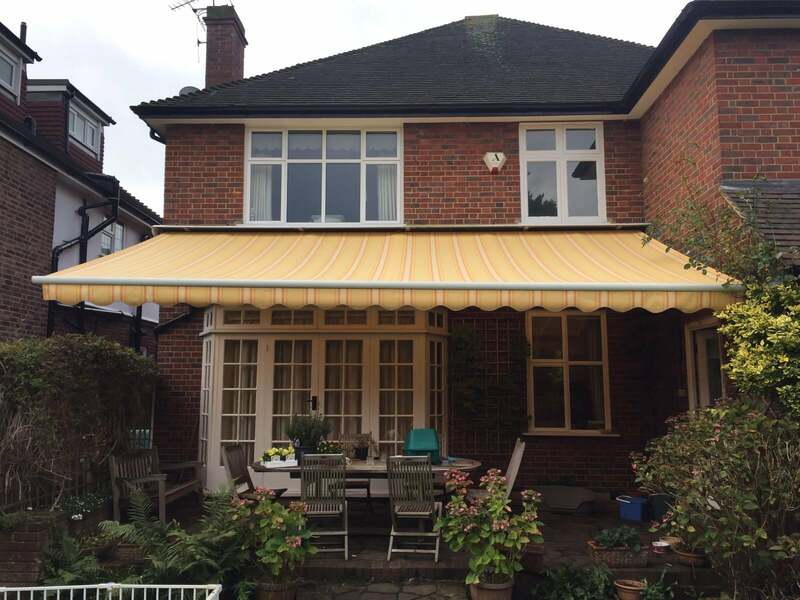 However two awnings can be coupled together to create huge widths. We have also installed awnings to over 10500mm with a single cover. The projection is governed by the width but tends to be around 2500mm to 3000mm. This will give you enough space to sit under as well as shade the inside of your home. We supply your Patio Awnings with either manual or motorised controls. This really depends on the size. When you get to 4000 mm wide you should really consider having it motorised. You will find your awning is a little heavy to wind if it’s bigger than that. 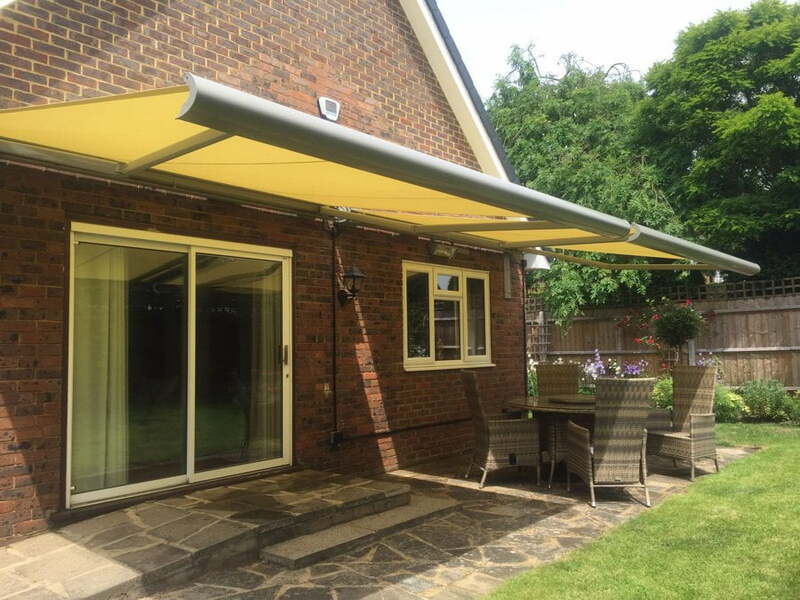 The motorised awnings can either work from a remote control handset or a wire free wall switch depending on your own personal preferences. You can even add sun and wind sensors to the motorised awnings so they will open and close automatically. The most important thing with Patio Awnings is the installation. These awnings are heavy, and secure fixings are paramount so speaking to a professional is important to get it right. Contact Radiant and we will be happy to visit free of charge and advise of the best solution. 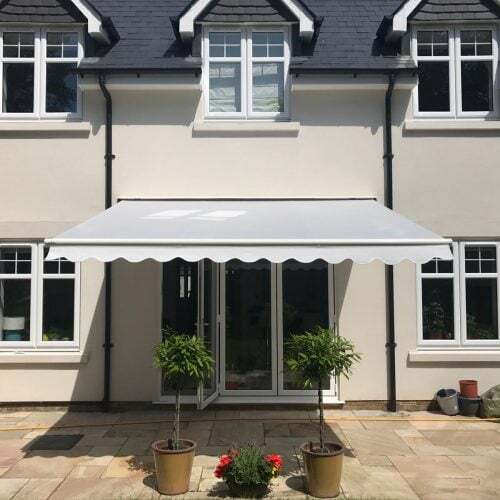 You can see example of the many Patio Awnings installations we do every year on our Domestic Projects section.